Defining who is and is not Jewish is a contentious issue. Is one’s Jewishness determined by halacha, or Jewish law? Is it determined by heritage? By an individual’s choice of whether or not to identify as Jewish? Whether one “looks” or “feels” Jewish? Or is the defining issue whether anti-Semites, such as the Nazis, would consider one to be Jewish? All of these factors have been used at different times and places to determine who is and who is not Jewish. This article focuses on the legal definitions, specifically how Jewish law defines it, how different movements within Judaism define it, and how the State of Israel defines it. Why does it matter? There are myriad practical implications. In Israel, where there is no civil marriage, marrying a Jew and being buried in a Jewish cemetery can be done only if the person in question is considered legally Jewish. In a synagogue, in order to be counted in a minyan, a prayer quorum, one must be Jewish, and so too if one wants to be called up to the Torah for an aliyah. So who decides who is a Jew? Historically, Judaism has held that a Jew is anyone born to a Jewish mother or converted to Judaism in a halakhic manner (that is, according to Jewish law). A halakhic conversion usually means that one is converting out of personal conviction –one believes the Torah to be the absolute truth — and has studied Jewish laws and traditions. READ: Must an Egg Donor Be Jewish for the Child to Be Considered Jewish? After this study period, a convert must be approved by a beit din — a court of observant Jews — and immerse in a mikveh (ritual bath). Men must also receive a circumcision or, if already circumcised, hatafat dam brit (symbolically taking a drop of blood). In the Conservative movement, conversion is similar to the traditional approach, though not identical. There is a specific course of study for the prospective convert, usually about 18 weeks, conducted in a private or classroom setting. If a Jewish mate is involved, he or she is expected to attend the course as well. Many Conservative rabbis will accept converts who are motivated by marriage, but some abstain from this practice. The Reform movement encourages those who want to be married to a Jew to convert and the couple is required to attend classes and events together in preparation for the conversion. Prospective converts are paired with mentors within the community who they can look to for guidance leading up to the actual conversion. Many Reform rabbis don’t require an immersion in the mikveh or brit milah for men, instead presenting the rituals as options, and allowing the convert to choose what seems most appropriate. In more recent times, new dimensions have emerged to the discussion of who is legally considered Jewish. In 1983 the Reform movement passed a resolution that accepted the Jewish identity of children of Jewish fathers and non-Jewish mothers. Recognizing what is known as patrilineal descent, the Reform movement ruled that these children were Jewish if they participated in the various Jewish lifecycle ceremonies which usually mark the life stages of a Jew. In Israel, the question of Jewish legal status has become even more controversial. Anyone with a single Jewish grandparent or a Jewish spouse is eligible to move to Israel and become a citizen under the Law of Return. But the Israeli Chief Rabbinate controls the marriage process for Jews in Israel, and their definition of Jewishness accords with traditional halacha. Thus, it is common to find people who are granted citizenship as Jews under the Law of Return, but are unable to legally marry as Jews (or marry Jews) in Israel. 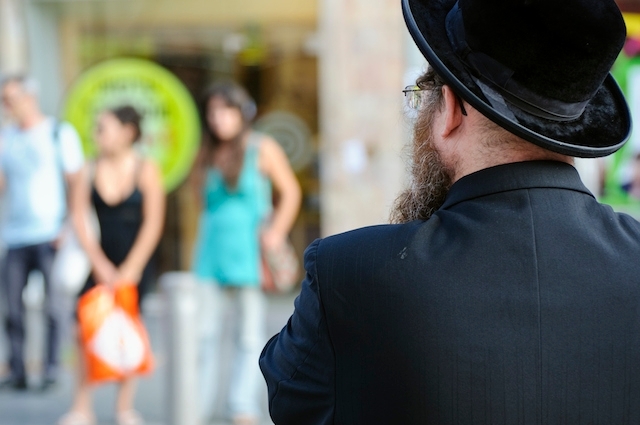 In addition, while the Israeli Supreme Court ruled that a person who has undergone a Reform or Conservative conversion abroad must be considered Jewish vis-à-vis the Law of Return, liberal conversions are not recognized by the Orthodox rabbinate. In 1998 the Jewish Agency established a conversion institute with members of all three major movements. Teachers at the institute come from the three major denominations of Judaism, but the actual conversion is left to the Orthodox courts. The Institute for Jewish Studies today offers 500 classes to help encourage Jewish study as well as conversion. The final step of conversion, however, is moving slowly and is bottlenecked, with only a few hundred conversions performed annually.